Lemongrass oil have also been tested in animal and rat study as an antimalarial, antioxidant, anticancer, antibacterial, anti-inflammatory, and antiviral agent. Lemongrass essential oil is harvested from the grassy stalks of the lemongrass plant and is carefully steam distilled to extract all the key benefits from this south India indigenous plant. 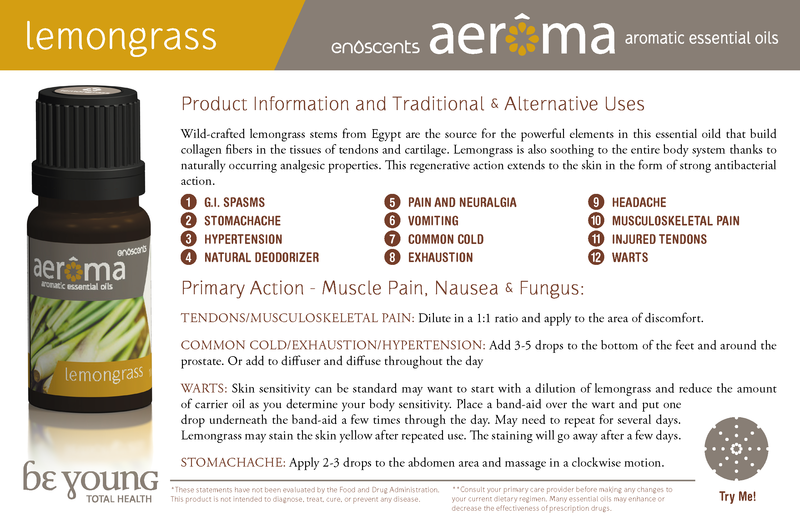 Lemongrass essential oils is used as aromatherapy to relieve muscle pain and body aches. When diffusing the essential oil, it transforms your living space into a place where you can receive clarity of your thoughts and relaxation. Also, helps to chase away those rainy-day blues and transform you to a place of tranquility. Analgesics: Lemongrass has exhibited analgesic effects in mice and rat study (72;​152;​153;​154). Antibacterials: Lemongrass has demonstrated antibacterial properties in laboratory study (58;​59;​63;​77;​78;​81;​84;​155;​156;​157;​158;​159;​160;​161;​162;​163;​164;​165;​166;​167;​168;​169;​170;​171;​172;​173;​174;​175;​176;​177). Some examples of organisms that lemongrass had activity against are Enterobacter spp., Escherichia coli, Salmonella enterica, Klebsiella pneumoniae, Haemophilus influenzae, Pseudomonas aeruginosa, Streptococcus aureus, Streptococcus pyogenes, Staphylococcus aureus, Propionibacterium acnes, Proteus mirabilis, and Morganella morganii (59;​81;​159;​160;​161;​162;​164;​168;​172;​174;​176;​178). Anticoagulants and antiplatelets: In in vitro study, the dichloromethane extract of Cymbopogon ambiguus caused significant inhibition of platelet activation (90;​110). Anticonvulsants: In animal study, the essential oils from Cymbopogon winterianus Jowitt and Cymbopogon citratus (DC) Stapf (particularly the constituents geraniol, ctironellal, and citronellol) displayed anticonvulsant effects, elevated the seizure threshold, or blocked seizure spread (74;​102;​112). The mechanism appeared to be dependent upon GABAergic neurotransmission, as evidenced in animal study (112). 203;​204;​205;​206;​207;​208;​209;​210;​211). Some examples of these fungi include various Aspergillus species, Rhizoctonia solani, Pyricularia orizea. Fusarium oxysporum, and antimycotic-resistant Candida species (Candida albicans, Candida glabrata, Candida krusei, Candida parapsilosis, and Candida tropicalis) (54;​55;​56;​57;​58;​59;​60;​61;​62;​63). Based on in vitro study, fungicidal activity was noted against Trichophyton mentagrophytes (211). Anti-inflammatory agents: Anti-inflammatory activity has been demonstrated in animal and laboratory study (89;​92;​180;​212). Antilipemic agents: In animal study, fresh leaf aqueous extract of Cymbopogon citratus Stapf has been found to have lower lipid parameters and increase HDL cholesterol, in a dose-dependent fashion (106). Antimalarials: Study in mice has shown that lemongrass is effective against the malaria parasite (111;​213;​214). Antioxidants: Lemongrass oil has been evaluated for its antioxidant properties (67;​97;​99;​221;​222;​223;​224;​225;​226). Antivirals: Lemongrass oil has shown antiviral activity against herpes simplex virus type-1 (HSV-1) in vitro (215). Hypoglycemics: Based on rat study, lemongrass has shown hypoglycemic effects (106), and caution should be taken when administering lemongrass with hypoglycemic medications, due to a possible additive decrease in blood glucose (130;​131). Hypotensives: Based on laboratory and animal study, lemongrass has shown cardiac and antihypertensive effects (117;​126;​127;​128;​129), and caution should be taken when administering with cardiac herbs, due to possible synergistic effects. Vasodilators: In animal study, citronellol, a monoterpene alcohol, displayed direct effects on the vascular smooth muscle leading to vasodilation (220).